Mathematics can be a powerful tool for students to make sense of the world around them. Without good estimation skills, we cannot approximate distances, or the number of people in a crowd, or how much our grocery bill will be, looking at a shopping cart full of groceries. What better way to develop good number concepts than through interesting and motivating activities that keep students actively learning mathematics! These days, learners are eager to crack their math books, not because the books have become easier but because we’ve changed the way we think about math. Our learners now know they can work with numbers successfully. They’re learning to understand rather than to memorize, anzd are developing strategies rather than a set of procedures. Math@JBCN is done through hands-on activities to make connections between abstract concepts and the concrete models that represent them. We also follow the Singapore Math strategies which motivate students to work with numbers. 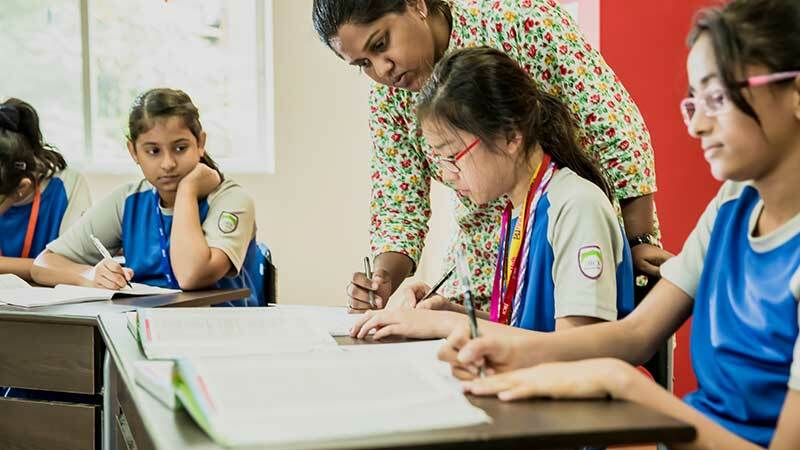 By giving learners a battery of Singaporean strategies, like branching, regrouping, partial quotient division, and many more, we make math accessible, and we approach it in context. Model drawing is the next and most widely known piece of the Singapore Math puzzle. It’s a step-by-step, visual method of translating a word problem into a diagram, in order to solve it. It works with word problems from addition all the way to algebra questions. Concepts like factors, LCM and HCF are abstract. When students use manipulative materials and reasoning skills to discover an abstract relationship, the learning is more meaningful and permanent. Students use square tiles to discover the relationship between rectangular arrays and prime and composite numbers.. By associating numbers with their factors in an area model, students acquire a deeper and longer-lasting understanding. Students will discover that prime numbers have only one rectangular array, whereas composite numbers have at least two. They also understand the meaning of factors. Learning math today is less about meaningless drill-work and more about understanding, less about procedure and more about application. Through these practical, hands-on strategies and manipulatives, learners are gradually growing in confidence and no longer see Math as everyone’s famous academic bugbear. In fact, the math class has become an area of joyous discovery and interesting applications! You’re so awesome! I do not believe I have read a single thing like this before. So great to discover another person with a few original thoughts on this subject matter. Seriously.. thanks for starting this up. This website is something that is needed on the web, someone with a bit of originality! It’s appropriate time to make some plans for the future and it’s time to be happy. I have read this post and if I could I desire to suggest you few interesting things or advice. Perhaps you can write next articles referring to this article. I want to read more things about it!